Location of Ann Arbor within Michigan. Ann Arbor was founded in 1824, with one theory stating that it is named after the spouses of the city's founders and for the stands of trees in the area. The University of Michigan moved from Detroit to Ann Arbor in 1837, and the city showed steady growth throughout the 19th and 20th centuries, except during the Depression of 1873. During the 1960s and 1970s, the city gained a reputation as a center for left-wing politics. Ann Arbor became a focal point for political activism and served as a hub for the civil-rights movement and anti-Vietnam War movement, as well as various student movements. Ann Arbor was founded in 1824 by land speculators John Allen and Elisha Rumsey. On May 25, 1824, the town plat was registered with Wayne County as "Annsarbour;" this represents the earliest known use of the town's name. There are various accounts concerning the origin of the settlement's name; one states that Allen and Rumsey decided to name it for their wives, both named Ann, and for the stands of burr oak in the 640 acres (259 ha) of land they purchased for $800 from the federal government at $1.25 per acre. The local Ojibwa named the settlement kaw-goosh-kaw-nick, after the sound of Allen's sawmill. Since the university's establishment in the city in 1837, the histories of the University of Michigan and Ann Arbor have been closely linked. The town became a regional transportation hub in 1839 with the arrival of the Michigan Central Railroad, and a north—south railway connecting Ann Arbor to Toledo and other markets to the south was established in 1878. Throughout 1840s and the 1850s settlers continued to come to Ann Arbor. While the earlier settlers were primarily of British ancestry, the newer settlers also consisted of Germans, Irish, and African-Americans. In 1851, Ann Arbor was chartered as a city, though the city showed a drop in population during the Depression of 1873. It was not until the early 1880s that Ann Arbor again saw robust growth, with new immigrants coming from Greece, Italy, Russia, and Poland. Ann Arbor saw increased growth in manufacturing, particularly in milling. Ann Arbor's Jewish community also grew after the turn of the 20th century, and its first and oldest synagogue, Beth Israel Congregation, was established in 1916. During the 1960s and 1970s, the city gained a reputation as an important center for liberal politics. Ann Arbor also became a locus for left-wing activism and served as a hub for the civil-rights movement and anti-Vietnam War movement, as well as the student movement. The first major meetings of the national left-wing campus group Students for a Democratic Society took place in Ann Arbor in 1960; in 1965, the city was home to the first U.S. teach-in against the Vietnam War. During the ensuing 15 years, many countercultural and New Left enterprises sprang up and developed large constituencies within the city. These influences washed into municipal politics during the early and mid-1970s when three members of the Human Rights Party (HRP) won city council seats on the strength of the student vote. During their time on the council, HRP representatives fought for measures including pioneering antidiscrimination ordinances, measures decriminalizing marijuana possession, and a rent-control ordinance; many of these remain in effect in modified form. Alongside these liberal and left-wing efforts, a small group of conservative institutions were born in Ann Arbor. These include Word of God (established in 1967), a charismatic inter-denominational movement; and the Thomas More Law Center (established in 1999), a religious-conservative advocacy group. In the past several decades, Ann Arbor has grappled with the effects of sharply rising land values, gentrification, and urban sprawl stretching into outlying countryside. On November 4, 2003, voters approved a greenbelt plan under which the city government bought development rights on agricultural parcels of land adjacent to Ann Arbor to preserve them from sprawling development. Since then, a vociferous local debate has hinged on how and whether to accommodate and guide development within city limits. Ann Arbor consistently ranks in the "top places to live" lists published by various mainstream media outlets every year. In 2008, it was ranked by CNNMoney.com 27th out of 100 "America's best small cities." And in the year 2010, Forbes listed Ann Arbor as one of the most liveable cities in the United States of America. According to the United States Census Bureau, the city has a total area of 28.70 square miles (74.33 km2), of which, 27.83 square miles (72.08 km2) of it is land and 0.87 square miles (2.25 km2) is water, much of which is part of the Huron River. Ann Arbor is about 35 miles (56 km) west of Detroit. Ann Arbor Charter Township adjoins the city's north and east sides. Ann Arbor is situated on the Huron River in a productive agricultural and fruit-growing region. The landscape of Ann Arbor consists of hills and valleys, with the terrain becoming steeper near the Huron River. The elevation ranges from about 750 feet (230 m) along the Huron River to over 1,000 feet (300 m) on the city's west side, near I-94. Generally, the west-central and northwestern parts of the city and UM's North Campus are the highest parts of the city; the lowest parts are along the Huron River and in the southeast. Ann Arbor Municipal Airport, which is south of the city at 42°13.38′N 83°44.74′W﻿ / ﻿42.223, -83.74567, has an elevation of 839 feet (256 m). Ann Arbor's "Tree Town" nickname stems from the dense forestation of its parks and residential areas. The city contains more than 50,000 trees along its streets and an equal number in parks. In recent years, the emerald ash borer has destroyed many of the city's approximately 10,500 ash trees. The city contains 157 municipal parks ranging from small neighborhood green spots to large recreation areas. Several large city parks and a university park border sections of the Huron River. Fuller Recreation Area, near the University Hospital complex, contains sports fields, pedestrian and bike paths, and swimming pools. The Nichols Arboretum, owned by the University of Michigan, is a 123-acre (49.8 ha) arboretum that contains hundreds of plant and tree species. It is on the city's east side, near the university's Central Campus. Located across the Huron River just beyond the university's North Campus is the university's Matthaei Botanical Gardens which contains 300 acres of gardens and a large tropical conservatory. Ann Arbor skyline looking northeast from Michigan Stadium. From left to right several Ann Arbor landmarks may be seen: The Tower Plaza condominium building, the tallest building in Ann Arbor; the Burton Memorial Tower on the Central Campus of the University of Michigan, a clock tower and carillon; the Michigan Union (flying a maize-and-blue flag); and the Central Power Plant, operated by the university). The Modern architecture building on the far right is the Stephen M. Ross School of Business. 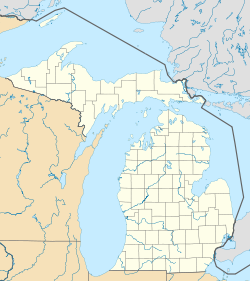 Ann Arbor has a typically Midwestern humid continental climate (Köppen Dfa), which is influenced by the Great Lakes. There are four distinct seasons: winters are cold with moderate to heavy snowfall, while summers are very warm and humid; in between, spring and autumn are short but mild. The area experiences lake effect weather, primarily in the form of increased cloudiness during late fall and early winter. The monthly daily average temperature in July is 72.6 °F (22.6 °C), while the same figure for January is 24.5 °F (−4.2 °C). Temperatures reach or exceed 90 °F (32 °C) on 10 days, and drop to or below 0 °F (−18 °C) on 4.6 nights. Precipitation tends to be the heaviest during the summer months, but most frequent during winter. Snowfall, which normally occurs from November to April and occasionally October, averages 58 inches (147 cm) per season. The lowest recorded temperature was −23 °F (−31 °C) on 11 February 1885, and the highest recorded temperature was 105 °F (41 °C) on 24 July 1934. As of the 2010 U.S. Census, there were 113,394 people, 45,634 households, and 21,704 families residing in the city. The population density was 4,270.33 people per square mile (2653.47/km²). There were 49,982 housing units at an average density of 1,748.0 per square mile (675.0/km²), making it less densely populated than inner-ring Detroit suburbs like Oak Park and Ferndale (and than Detroit proper), but more densely populated than outer-ring suburbs like Livonia or Troy. The racial makeup of the city was 73.0% White (70.4% non-Hispanic White), 7.7% Black or African American, 0.3% Native American, 14.4% Asian, 0.0% Pacific Islander, 1.0% from other races, and 3.6% from two or more races. Hispanic or Latino of any race were 4.1% of the population. In 2010 there was a total of 45,166 households, with an average of 2.51 persons per household. As of 2000 the ancestry reports collected by the US census showed that in Ann Arbor 14.9% were of German, 8.5% English and 7.9% Irish ancestry according to Census 2000. 79.2% spoke only English at home, while 3.2% spoke Chinese or Mandarin, 3.1% Spanish, 1.9% Korean, 1.2% German, 1.1% Japanese and 1.0% French. Because of the pull of the university, the city has one of the highest foreign-born populations in the state, at 17.4%. In 2000 Out of the 45,693 households, 23.0% had children under the age of 18 living with them, 37.8% were married couples living together, 7.5% had a female householder with no husband present, and 52.5% were nonfamilies. 35.5% of households were made up of individuals and 6.6% had someone living alone who was 65 years of age or older. The average household size was 2.22 and the average family size was 2.90. The age distribution was 16.8% under 18, 26.8% from 18 to 24, 31.2% from 25 to 44, 17.3% from 45 to 64, and 7.9% were 65 or older. The median age was 28 years. For every 100 females there were 97.7 males; while for every 100 females age 18 and over, there were 96.4 males. As of April 2013, Ann Arbor has the second largest Japanese national population in the State of Michigan, 1,541, after Novi, which had 2,666 Japanese nationals. High tech companies have located in the area since the 1930s, when International Radio Corporation introduced the first mass-produced AC/DC radio (the Kadette, in 1931) as well as the first pocket radio (the Kadette Jr., in 1933). The Argus camera company, originally a subsidiary of International Radio, manufactured cameras in Ann Arbor from 1936 to the 1960s. Current firms include Arbor Networks (provider of Internet traffic engineering and security systems), Arbortext (provider of XML-based publishing software), JSTOR (the digital scholarly journal archive), MediaSpan (provider of software and online services for the media industries), and ProQuest, which includes UMI. Ann Arbor Terminals manufactured a video-display terminal called the Ann Arbor Ambassador during the 1980s. Barracuda Networks, which provides networking, security, and storage products based on network appliances and cloud services, opened an engineering office in Ann Arbor in 2008 on Depot St. and recently announced it will move downtown to occupy the building previously used as the Borders headquarters. Websites and online media companies in or near the city include All Media Guide, the Weather Underground, and Zattoo. Ann Arbor is the home to Internet2 and the Merit Network, a not-for-profit research and education computer network. Both are located in the South State Commons 2 building on South State Street, which once housed the Michigan Information Technology Center Foundation. The city is also home to the headquarters of Google's AdWords program—the company's primary revenue stream. The recent surge in companies operating in Ann Arbor has led to a decrease in its office and flex space vacancy rates. As of December 31, 2012, the total market vacancy rate for office and flex space is 11.80%, a 1.40% decrease in vacancy from one year ago, and the lowest overall vacancy level since 2003. The office vacancy rate decreased to 10.65% in 2012 from 12.08% in 2011, while the flex vacancy rate decreased slightly more, with a drop from 16.50% to 15.02%. Pfizer, once the city's second largest employer, operated a large pharmaceutical research facility on the northeast side of Ann Arbor. On 22 January 2007, Pfizer announced it would close operations in Ann Arbor by the end of 2008. The facility was previously operated by Warner-Lambert and, before that, Parke-Davis. In December 2008, the University of Michigan Board of Regents approved the purchase of the facilities, and the university anticipates hiring 2,000 researchers and staff during the next 10 years. The city is the home of other research and engineering centers, including those of Lotus Engineering, General Dynamics and the National Oceanic and Atmospheric Administration (NOAA). Other research centers sited in the city are the United States Environmental Protection Agency's National Vehicle and Fuel Emissions Laboratory and the Toyota Technical Center. The city is also home to National Sanitation Foundation International, AKA: NSF International, the nonprofit non-governmental organization that develops generally accepted standards for a variety of public health related industries and subject areas. Borders Books, started in Ann Arbor, was opened by brothers Tom and Louis Borders in 1971 with a stock of used books. The Borders chain was based in the city, as was its flagship store until it closed in September 2011. Domino's Pizza's headquarters is near Ann Arbor on Domino's Farms, a 271 acres (109.7 ha) Frank Lloyd Wright-inspired complex just northeast of the city. Another Ann Arbor-based company is Zingerman's Delicatessen, which serves sandwiches, and has developed businesses under a variety of brand names. Zingerman's has grown into a family of companies which offers a variety of products (bake shop, mail order, creamery, coffee) and services (business education). Flint Ink Corp., another Ann Arbor-based company, was the world's largest privately held ink manufacturer until it was acquired by Stuttgart-based XSYS Print Solutions in October 2005. Avfuel, a global supplier of aviation fuels and services, is also headquartered in Ann Arbor. Aastrom Biosciences, a publicly traded company that develops stem cell treatments for cardiovascular diseases is headquartered in Ann Arbor. Many cooperative enterprises were founded in the city; among those that remain are the People's Food Co-op and the Inter-Cooperative Council at the University of Michigan, a student housing cooperative founded in 1937. The North American Students of Cooperation (NASCO) is an international association of cooperatives headquartered in Ann Arbor. There are also three cohousing communities—Sunward, Great Oak, and Touchstone—located immediately to the west of the city limits. Several performing arts groups and facilities are on the University of Michigan's campus, as are museums dedicated to art, archaeology, and natural history and sciences. Founded in 1879, the University Musical Society is an independent performing arts organization that presents over 60 events each year, bringing international artists in music, dance, and theater. Regional and local performing arts groups not associated with the university include the Ann Arbor Civic Theatre, the Arbor Opera Theater, the Ann Arbor Symphony Orchestra, the Ann Arbor Ballet Theater, the Ann Arbor Civic Ballet (established in 1954 as Michigan's first chartered ballet company), The Ark, and Performance Network Theatre. Another unique piece of artistic expression in Ann Arbor is the fairy doors. These small portals are examples of installation art and can be found throughout the downtown area. Several annual events—many of them centered on performing and visual arts—draw visitors to Ann Arbor. One such event is the Ann Arbor Art Fairs, a set of four concurrent juried fairs held on downtown streets. Scheduled on Wednesday through Saturday in the third week of July, the fairs draw upward of half a million visitors. Another is the Ann Arbor Film Festival, held during the third week of March, which receives more than 2,500 submissions annually from more than 40 countries and serves as one of a handful of Academy Award–qualifying festivals in the United States. Ann Arbor has a major scene for college sports, notably at the University of Michigan, a member of the Big Ten Conference. Several well-known college sports facilities exist in the city, including Michigan Stadium, the largest American football stadium in the world with a 109,901 seating capacity. The stadium is colloquially known as "The Big House." Crisler Center and Yost Ice Arena play host to the school's basketball and ice hockey teams, respectively. Concordia University, a member of the NAIA, also fields sports teams. A person from Ann Arbor is called an Ann Arborite, and many long-time residents call themselves townies. The city itself is often called A² ("A-squared") or A2 ("A two"), "The Deuce", "Ace Deuce", and Tree Town. With tongue-in-cheek reference to the city's liberal political leanings, some occasionally refer to Ann Arbor as The People's Republic of Ann Arbor or 25 square miles surrounded by reality, the latter phrase being adapted from Wisconsin Governor Lee Dreyfus's description of Madison, Wisconsin. In A Prairie Home Companion broadcast from Ann Arbor, Garrison Keillor described Ann Arbor as "a city where people discuss socialism, but only in the fanciest restaurants." Ann Arbor sometimes appears on citation indexes as an author, instead of a location, often with the academic degree MI, a misunderstanding of the abbreviation for Michigan. The Ann Arbor News, owned by the Michigan-based Booth Newspapers chain, was the major daily newspaper serving Ann Arbor and the rest of Washtenaw County. The newspaper ended its 174-year print run in 2009, due to economic difficulties. It has been replaced by AnnArbor.com, which has a semi-weekly print operation in addition to its website. Another Ann Arbor-based publication that has ceased production was the Ann Arbor Paper, a free monthly. Ann Arbor has been said to be the first significant city to lose its only daily paper. Current publications in the city include the Ann Arbor Journal (A2 Journal), a weekly community newspaper; Ann Arbor Observer, a free monthly local magazine; and Current, a free entertainment-focused alt-weekly. The Ann Arbor Business Review covers local business in the area. The Ann Arbor Chronicle is an online newspaper that covers local news, including meetings of the library board, county commission, and DDA. Car and Driver magazine and Automobile Magazine are also based in Ann Arbor. The University of Michigan is served by many student publications, including the independent Michigan Daily student newspaper, which reports on local, state, and regional issues in addition to campus news. Four major AM radio stations based in or near Ann Arbor are WAAM 1600, a conservative news and talk station; WLBY 1290, a business news and talk station; WDEO 990, Catholic radio; and WTKA 1050, which is primarily a sports station. The city's FM stations include NPR affiliate WUOM 91.7; country station WWWW 102.9 and adult-alternative station WQKL 107.1. Freeform station WCBN-FM 88.3 is a local community radio/college radio station operated by the students of the University of Michigan featuring noncommercial, eclectic music and public-affairs programming. The city is also served by public and commercial radio broadcasters in Ypsilanti, the Lansing/Jackson area, Detroit, Windsor, and Toledo. WPXD channel 31, an affiliate of the ION Television network, is licensed to the city. WHTV channel 18, a MyNetworkTV-affiliated station for the Lansing market, broadcasts from a transmitter in Lyndon Township, west of Ann Arbor. Community Television Network (CTN) is a city-provided cable television channel with production facilities open to city residents and nonprofit organizations. Detroit and Toledo-area radio and television stations also serve Ann Arbor, and stations from Lansing and Windsor, Ontario, can be heard in parts of the area. The Guy C. Larcom, Jr. Municipal Building housed the city hall and police station. It is in the process of major renovations, including a new adjacent and connected structure that will become the new face of city hall. Ann Arbor has a council-manager form of government. The City Council has 11 voting members: the mayor and 10 city council members. The mayor and city council members serve two-year terms: the mayor is elected every even-numbered year, while half of the city council members up for election annually (five in even-numbered and five in odd-numbered years). Two council members are elected from each of the city's five wards. The mayor is elected citywide. The mayor is the presiding officer of the City Council and has the power to appoint all Council committee members as well as board and commission members, with the approval of the City Council. The current mayor of Ann Arbor is John Hieftje, a Democrat who was first elected as mayor in 2000. Day-to-day city operations are managed by a city administrator chosen by the city council. Ann Arbor is part of Michigan's 15th congressional district, represented in Congress by Representative John Dingell, a Democrat. On the state level, the city is part of the 18th district in the Michigan Senate, represented by Democrat Rebekah Warren. In the Michigan House of Representatives, representation is split between the 55th district (northern Ann Arbor, part of Ann Arbor Township, and other surrounding areas, represented by Democrat Adam Zeke), the 53rd district (most of downtown and the southern half of the city, represented by Democrat Jeff Irwin) and the 52nd district (southwestern areas outside Ann Arbor proper and western Washtenaw County, represented by Democrat Gretchen Driskell). Left-wing politics have been particularly strong in municipal government since the 1960s. Voters approved charter amendments that have lessened the penalties for possession of marijuana (1974), and that aim to protect access to abortion in the city should it ever become illegal in the State of Michigan (1990). In 1974, Kathy Kozachenko's victory in an Ann Arbor city-council race made her the country's first openly homosexual candidate to win public office. In 1975, Ann Arbor became the first U.S. city to use instant-runoff voting for a mayoral race. Adopted through a ballot initiative sponsored by the local Human Rights Party, which feared a splintering of the liberal vote, the process was repealed in 1976 after use in only one election. As of August 2009, Democrats hold the mayorship and all council seats. The left tilt of politics in the city have earned it the nickname "The People's Republic of Ann Arbor". University of Michigan Law School Legal Research Building. The University of Michigan dominates the city of Ann Arbor, providing the city with its distinct college-town character. Other local colleges and universities include Concordia University Ann Arbor, a Lutheran liberal-arts institution; a campus of the University of Phoenix; and Cleary University, a private business school. Washtenaw Community College is located in neighboring Ann Arbor Township. In 2000, the Ave Maria School of Law, a Roman Catholic law school established by Domino's Pizza founder Tom Monaghan, opened in northeastern, but the school moved to Ave Maria, Florida in 2009, and the Thomas M. Cooley Law School acquired the former Ave Maria buildings for use as a branch campus. Public schools are part of the Ann Arbor Public Schools (AAPS) district. AAPS has one of America's leading music programs. In September 2008, 16,539 students had been enrolled in the Ann Arbor Public Schools. There were of 21 elementary schools, five middle schools (Forsythe, Slauson, Tappan, Scarlett, and Clague) three traditional high schools (Pioneer, Huron, and Skyline), and three alternative high schools (Community High, Stone School, and Roberto Clemente) in the district. The district also operates a K-8 open school program, Ann Arbor Open School, out of the former Mack School. This program is open to all families who live within the district. Ann Arbor Public Schools also operates a preschool and family center, with programs for at-risk infants and at-risk children before kindergarten. The district has a preschool center with both free and tuition-based programs for preschoolers in the district. Ann Arbor is home to more than 20 private schools, including the Rudolf Steiner School of Ann Arbor, Clonlara School and Greenhills School, a prep school. The city is also home to several charter schools such as Washtenaw Technical Middle College and Honey Creek Community School. At Washtenaw Technical Middle College, students can earn an associate's degree at Washtenaw Community College and a high school diploma at the same time. The city provides sewage disposal and water supply services, with water coming from the Huron River and groundwater sources. There are two water-treatment plants, one main and three outlying reservoirs, four pump stations, and two water towers. These facilities serve the city, which is divided into five water districts. The city's water department also operates four dams along the Huron River, two of which provide hydroelectric power. The city also offers waste management services, with Recycle Ann Arbor's handling recycling service. Other utilities are provided by private entities. Electrical power and gas are provided by DTE Energy. AT&T Inc. is the primary wired telephone service provider for the area. Cable TV service is primarily provided by Comcast. The Ann Arbor Transportation Authority (AATA), which brands itself as "The Ride", operates public bus services throughout the city and nearby Ypsilanti. A separate zero-fare bus service operates within and between the University of Michigan campuses. Since April 2012, route 787 (the "AirRide") connects to Detroit Airport a dozen times a day. A downtown bus depot served by Greyhound Lines provides out-of-town bus service, and is the city's only remaining example of the Streamline Moderne architectural style. Megabus has twice daily direct service to Chicago, Illinois, while a bus service provided by Amtrak for rail passengers making connections services East Lansing and Toledo, Ohio. The Michigan Flyer, a service operated by Indian Trails, cooperates with AATA for their AirRide and additionally offers bus service to Jackson, and East Lansing. Special bus shuttle service to Detroit Airport is available for a low fare before and after university breaks, too. Ann Arbor Municipal Airport is a small, city run general aviation airport located south of I-94. Detroit Metropolitan Airport, the area's large international airport, is about 25 miles (40 km) east of the city, in Romulus. Willow Run Airport east of the city near Ypsilanti serves freight, corporate, and general aviation clients. The city was a major rail hub, notably for freight traffic between Toledo and ports north of Chicago, Illinois, from 1878 to 1982; however, the Ann Arbor Railroad also provided passenger service in 1913. The city was also served by the Michigan Central Railroad starting in 1837. Ann Arbor and Ypsilanti Street Railway, Michigan's first interurban, served the city from 1891 to 1929. ^ "American FactFinder". United States Census Bureau. http://factfinder2.census.gov/faces/nav/jsf/pages/index.xhtml. Retrieved 2012-11-25. ^ a b "Ann Arbor". Geographic Names Information System, U.S. Geological Survey. http://geonames.usgs.gov/pls/gnispublic/f?p=gnispq:3:::NO::P3_FID:0620133. ^ "Bibliography on Washtenaw County". Clarke Historical Library, Central Michigan University. http://clarke.cmich.edu/resource_tab/bibliographies_of_clarke_library_material/michigan_local_history/county_material/washtenaw.html. Retrieved January 23, 2013. ^ "1824–1859: Education. Pictorial History of Ann Arbor: 1824–1974". Ann Arbor District Library. 2006. http://moaa.aadl.org/moaa/pictorial_history/1824-1859pg3. Retrieved 2009-12-04. ^ "1824–1859: Government and Growth. Pictorial History of Ann Arbor: 1824–1974". Ann Arbor District Library. 2006. http://moaa.aadl.org/moaa/pictorial_history/1824-1859pg6. Retrieved 2009-12-04. ^ "1880–1899: Setbacks and Renewed Growth. Pictorial History of Ann Arbor: 1824–1974". Ann Arbor District Library. 2006. http://moaa.aadl.org/moaa/pictorial_history/1880-1899pg1. Retrieved 2009-12-04. ^ "1900–1919: Population and Economic Growth. Pictorial History of Ann Arbor: 1824–1974". Ann Arbor District Library. 2006. http://moaa.aadl.org/moaa/pictorial_history/1900-1919pg1. Retrieved 2009-12-04. ^ a b c , Beth Israel Congregation website, About Us. Retrieved 5 March 2013. ^ Restivo, Terrence R. (2006-03-22). "The Building of a New Left Conglomerate in the City of Ann Arbor: VOICE, Action Movement and the Human Rights Party (1965–1975)" (PDF). McAnulty College and Graduate School of Liberal Arts, Duquesne University. Archived from the original on 2007-12-01. https://web.archive.org/web/20071201164218/http://etd1.library.duq.edu/theses/available/etd-03312006-154729/unrestricted/RestivoThesis.pdf. Retrieved 2008-08-23. ^ "History". Thomas More Law Center. 2009. Archived from the original on 2012-01-17. https://web.archive.org/web/20120117125839/http://www.thomasmore.org/qry/page.taf?id=24. Retrieved 2013-03-05. ^ "Inside the Eastside: History of East Ann Arbor, Michigan (MI)". http://pittsfieldhistory.org/index.php?section=history&content=east_ann_arbor#services. Retrieved 2010-04-09. ^ "Ann Arbor Parks and Greenbelt Proposal". Friends of Ann Arbor Open Space. 2 March 2004. Archived from the original on 23 July 2008. http://www.a2openspace.org/. Retrieved 2008-08-04. ^ McGovern, Judy (2009-05-18). "Ann Arbor seeks grants for greenbelt land". The Ann Arbor News. Retrieved on 2009-08-24. ^ "Best Places to Live—Money's List of America's Best Small Cities". CNNMoney.com. August 2008. Archived from the original on 5 October 2009. https://web.archive.org/web/20091005045948/http://money.cnn.com/magazines/moneymag/bplive/2008/top100/index2.html. Retrieved 2009-08-24. ^ Levy, Francesca. "America's Most Livable Cities". Forbes. Archived from the original on 2012-07-31. http://archive.is/tmXI. ^ (1911) "Ann Arbor". 1911 Encyclopædia Britannica. ^ "KARB—Ann Arbor Municipal Airport". Federal Aviation Administration at Airnav.com. 2007-03-15. Archived from the original on 25 July 2008. http://www.airnav.com/airport/KARB. Retrieved 2008-08-04. ^ "Fun Facts". Ann Arbor Area Convention and Visitor's Bureau. 2006. Archived from the original on 2006-02-24. https://web.archive.org/web/20060224212952/http://www.annarbor.org/aboutannarbor/funfacts.asp. Retrieved 2009-08-25. ^ Davis, Tracy (2007-04-02). "Last of street ash trees cut down". The Ann Arbor News. Retrieved on 2009-08-30. ^ a b c "Master Plans—General Information". Ann Arbor City Government. 2009. Archived from the original on 6 October 2009. http://www.a2gov.org/GOVERNMENT/COMMUNITYSERVICES/PLANNINGANDDEVELOPMENT/PLANNING/Pages/MasterPlans.aspx. Retrieved 2009-08-30. ^ "Ann Arbor Farmers' Market". Ann Arbor City Government. 2007. Archived from the original on 2007-05-18. https://web.archive.org/web/20070518213203/http://www.a2gov.org/CommunityServices/Parks/Farmers+Market/farmers_main.html. Retrieved 2008-08-23. ^ "Washtenaw County Resource Assessment" (PDF). Washtenaw County Conservation District. September 2006. http://www.washtenawcd.org/about/2006resourceassess.pdf. Retrieved 2009-11-01. ^ a b c d "NowData – NOAA Online Weather Data". National Oceanic and Atmospheric Administration. http://www.nws.noaa.gov/climate/xmacis.php?wfo=dtx. Retrieved 2012-02-27. ^ "Station Name: MI ANN ARBOR U OF MICH". National Oceanic and Atmospheric Administration. ftp://ftp.ncdc.noaa.gov/pub/data/normals/1981-2010/products/station/USC00200230.normals.txt. Retrieved 2013-03-19. ^ "U.S. Census Bureau Population Finder". U.S. Census Bureau. 2009. http://factfinder.census.gov/servlet/SAFFPopulation?_event=ChangeGeoContext&geo_id=16000US2603000&_geoContext=01000US&_street=&_county=Ann+Arbor&_cityTown=Ann+Arbor&_state=04000US26&_zip=&_lang=en&_sse=on&ActiveGeoDiv=geoSelect&_useEV=&pctxt=fph&pgsl=010&_submenuId=population_0&ds_name=null&_ci_nbr=null&qr_name=null&reg=null%3Anull&_keyword=&_industry=. Retrieved 2010-08-10. ^ a b "Ann Arbor (city), Michigan". U.S. Census Bureau. 2010. http://quickfacts.census.gov/qfd/states/26/2603000.html. Retrieved 2012-08-04. ^ a b c "Ann Arbor city, Michigan fact sheet". U.S. Census Bureau. 2000. http://factfinder2.census.gov/faces/tableservices/jsf/pages/productview.xhtml?pid=DEC_10_PL_QTPL&prodType=table. Retrieved 2010-05-21. ^ "Ann Arbor city, Michigan, 2006–2008 American Community Survey 3-Year Estimates". United States Census Bureau. 2009. http://factfinder.census.gov/servlet/ACSSAFFFacts?_event=Search&geo_id=04000US26&_geoContext=01000US%7C04000US26&_street=&_county=Ann+Arbor&_cityTown=Ann+Arbor&_state=04000US26&_zip=&_lang=en&_sse=on&ActiveGeoDiv=geoSelect&_useEV=&pctxt=fph&pgsl=040&_submenuId=factsheet_1&ds_name=ACS_2008_3YR_SAFF&_ci_nbr=null&qr_name=null&reg=null%3Anull&_keyword=&_industry=. Retrieved 2009-12-04. ^ "Ann Arbor city, Michigan – MapStats". FedStats. 2006-10-24. Archived from the original on 30 August 2008. http://www.fedstats.gov/qf/states/26/2603000.html. Retrieved 2008-08-04. ^ a b "Ann Arbor, MI". US News and World Reports. 2010. Archived from the original on 2012-01-01. https://web.archive.org/web/20120101184700/http://money.usnews.com/money/retirement/best-places-to-retire/michigan/ann_arbor. Retrieved 5 March 2013. ^ Mahon, Morgan E. (1990). "A Flick of the Switch 1930–1950": 100–1. ^ "Contact Us". ProQuest. 2009. http://www.proquest.com/en-US/aboutus/contactus.shtml. Retrieved 23 August 2009. ^ Martin, Mike. "Barracuda Networks moves into 201 Depot Street in Ann Arbor". Concentrate Media. http://www.concentratemedia.com/devnews/201depotannarbor0027.aspx. Retrieved 29 June 2012. ^ Alfs, Lizzy. "Barracuda Networks signs deal to move hundreds of jobs to ex-Borders offices in downtown Ann Arbor". AnnArbor.com. http://annarbor.com/business-review/barracuda-networks-bringing-hundreds-of-jobs-to-ex-borders-building-in-downtown-ann-arbor/. Retrieved 29 June 2012. ^ Bomey, Nathan (29 August 2010). "Michigan Information Technology Center dissolving after Ann Arbor nonprofit lost $4.6M over 3 years". Business Review (AnnArbor.com). http://www.annarbor.com/business-review/mitc-foundation-to-dissolve-after-losing-46-million-in-3-year-stretch/. Retrieved 19–2 October 10. ^ Goodman, David N. (11 July 2006). "Google Plans to Open Facility in Michigan". The Washington Post. Retrieved on 4 August 2008. ^ "Swisher Commercial's Annual Ann Arbor Office/Flex Space Vacancy Report-2012". Swisher Commercial. http://www.swishercommercial.com/vacancy-report. Retrieved 28 April 2013. ^ Stefanie Murray (19 January 2008). "One year later: Pfizer labs emptying out". The Ann Arbor News. Retrieved on 25 August 2009. ^ "U-M to buy Pfizer's former Ann Arbor property". University of Michigan News Service. 18 December 2008. http://ns.umich.edu/htdocs/releases/story.php?id=6895. Retrieved 19 October 2010. ^ "National Vehicle and Fuel Emissions Laboratory". United States Environmental Protection Agency. 3 April 2007. Archived from the original on 20 September 2008. http://www.epa.gov/nvfel/. Retrieved 23 August 2008. ^ "Our Business—Research & Development". Toyota Motor North America, Inc. 2010. Archived from the original on 6 October 2010. http://www.toyota.com/about/our_business/research_and_development/. Retrieved 19 October 2010. ^ Nathan Bomey and Greg Migliore (15 November 2007). "Company of 2007: NSF International". Ann Arbor Business Review. Retrieved on 6 September 2009. ^ Dolan, Matthew (2011-07-21). "Lamenting Borders' Death at 'Store No. 1'". The Wall Street Journal. http://online.wsj.com/article/SB10001424052702303661904576455913644424424.html. Retrieved 2013-03-05. ^ Migliore, Greg (2007-11-15). "Commercial Real Estate winner: Domino's Farms". Ann Arbor Business Review. Retrieved on 2009-09-06. ^ Albanese, Erin (2008-09-01). "Zingerman's recipe for success will be served". The Grand Rapids Press. Retrieved on 2009-09-06. ^ "Flint Ink and XSYS Print Solutions Agree to Merge". Flint Group. 20 July 2005. Archived from the original on 2007-10-20. https://web.archive.org/web/20071020023945/http://flintgrp.com/FlintGroupPressRelease.nsf/0/49F3D7414F165D04852571BF005D9867?OpenDocument. Retrieved 2008-08-23. ^ Meisler, Dan (2008-04-18). "Aviation fuel co. plans Ann Arbor HQ expansion". Ann Arbor Business Review. Retrieved on 2009-09-06. ^ "About Aastrom Biosciences – Stem Cell Therapeutics". http://www.aastrom.com/about-aastrom/. ^ "About ICC—Inter-Cooperative Council". Inter-Cooperative Council, Ann Arbor, MI, U.S.A.. 2007. Archived from the original on 2008-06-24. https://web.archive.org/web/20080624064519/http://www.icc.coop/learn/history/. Retrieved 2008-08-04. ^ "Communities Directory". Fellowship for Intentional Community. 2010. http://directory.ic.org/intentional_communities_in_Michigan. Retrieved 19 October 2010. ^ Headlee, Celeste (2006-05-09). "The Wee Fairy Doors of Ann Arbor, Mich.". NPR. http://www.npr.org/templates/story/story.php?storyId=5393277. Retrieved 2012-08-04. ^ "Ann Arbor Guide 2003–4". Ecurrent.com. 2003–2004. Archived from the original on 2004-12-10. https://web.archive.org/web/20041210170216/http://ecurrent.com/ag/2003/shop/list.php#boo. Retrieved 2008-08-04. ^ "Gerald R. Ford Presidential Library and Museum". Presidential Libraries System – National Archives and Records Administration. Archived from the original on 25 August 2009. http://www.fordlibrarymuseum.gov/library/aboutlib.asp. Retrieved 2009-08-13. ^ "About". Ann Arbor Film Festival. Archived from the original on 21 June 2009. http://www.aafilmfest.org/about/. Retrieved 2009-05-31. ^ "40 years of Hash Bash: Marijuana festival started in 1972 in Ann Arbor stands test of time". Ann Arbor.com. 2011-03-31. http://www.annarbor.com/news/40-years-of-hash-bash-marijuana-festival-that-started-in-early-1970s-still-going-strong-in-ann-arbor/#.UB0h48gSRbM. Retrieved 2012-08-04. ^ "Michigan Stadium". MGoBlue.com. 2009-06-05. http://www.mgoblue.com/facilities/michigan-stadium.html. Retrieved 2009-08-23. ^ "University of Michigan Athletics Facilities". MGoBlue.com. 2009. Archived from the original on 2008-05-30. https://web.archive.org/web/20080530195324/http://www.mgoblue.com/facilities/page.aspx?id=12098. Retrieved 2009-08-23. ^ Bakopoulos, Dean (17 April 1997). "Places I'll remember: A farewell to Ann Arbor". The Michigan Daily. Archived from the original on 2 January 2008. https://web.archive.org/web/20080102004715/http://www.pub.umich.edu/daily/1997/apr/04-17-97/week/arts21.html. Retrieved 29 August 2010. ^ "Welcome to Ann Arbor". Booth Newspapers – The Ann Arbor News. 2007. Archived from the original on 2006-06-21. https://web.archive.org/web/20060621195124/http://www.boothnewspapers.com/markets/aa.html. Retrieved 2008-08-04. ^ Postellon DC (March 2008). "Hall and Keynes join Arbor in the citation indexes". Nature 452 (7185). DOI:10.1038/452282b. PMID 18354457. ^ "Fire Up Downtown". University of Michigan–Arts at Michigan. 2004. Archived from the original on 30 December 2007. https://web.archive.org/web/20071230112927/http://www.arts.umich.edu/programs/special/firehydrant/index.html. Retrieved 4 August 2008. ^ Murray, Stefanie (2009-03-23). "Ann Arbor News to Close in July". The Ann Arbor News. Retrieved on 2009-03-23. ^ "Ann Arbor Publications". Arborweb.com. 2007. Archived from the original on 28 August 2008. http://www.arborweb.com/cg/t0131.html. Retrieved 2008-08-04. ^ Edmonds, Rick (2009-06-16). "Why Ann Arbor Will be the First City to Lose its Only Daily Newspaper | Poynter". Poynter.. http://www.poynter.org/latest-news/business-news/the-biz-blog/96340/why-ann-arbor-will-be-the-first-city-to-lose-its-only-daily-newspaper/. Retrieved 2012-04-21. ^ "Ann Arbor Journal – regional and local news". Heritage.com. http://heritage.com/ann_arbor_journal/. Retrieved 2012-04-21. ^ "Ann Arbor Current | Alternative Weekly Network | AWN Directory". Print.awn.org. http://print.awn.org/businesses/ann_arbor_current/85. Retrieved 2012-04-21. ^ (January 2009) "Hard Times at the Ann Arbor News". Ann Arbor Observer. ^ Migliore, Greg (2008-03-06). "Car and Driver cruising to new Ann Arbor offices". Ann Arbor Business Review. Retrieved on 2009-09-06. ^ "About the Daily". The Michigan Daily. http://www.michigandaily.com/about. Retrieved 2012-08-04. ^ a b "Southeast Michigan Radio and TV Dial Guide". Michiguide. http://www.michiguide.com/dials/detroit.html. Retrieved 2012-08-05. ^ "Government". Ann Arbor City Council. 2007. Archived from the original on 2007-05-13. https://web.archive.org/web/20070513001747/http://www.a2gov.org/citycouncil/index.html. Retrieved 2008-08-23. ^ "Charter for the City of Ann Arbor, Michigan" (PDF). Ann Arbor City Government. 1956-04-09. pp. 9, 41. Archived from the original on 2011-10-03. https://web.archive.org/web/20111003030858/http://www.a2gov.org/government/city_administration/City_Clerk/Documents/charter.pdf. Retrieved 2013-03-05. ^ "Guy Larcom's name peeled from exterior of city hall, but building will remain named in his honor". Annarbor.com. 2011-04-14. http://www.annarbor.com/news/guy-larcoms-name-peeled-from-exterior-of-city-hall-but-building-will-remain-named-in-his-honor/. Retrieved 2012-04-21. ^ "Michigan House of Representatives: Find A Representative". http://www.house.mi.gov/mhrpublic/. ^ "WASHTENAW COUNTY TRIAL COURT – Washtenaw County Trial Court". Washtenawtrialcourt.org. 2012-02-20. http://washtenawtrialcourt.org/. Retrieved 2012-04-21. ^ The other areas of Washtenaw County are served by other district courts: District 14-B court serves the Charter Township of Ypsilanti, District 14-A, based in the City of Ypsilanti, serves all other areas of Washtenaw County. ^ "The Ugliest Building in Ann Arbor? | Ann Arbor District Library". Aadl.org. http://www.aadl.org/node/5049. Retrieved 2012-04-21. ^ Wednesday, 8 April 2009 (2009-04-08). "Downtown Ann Arbor’s Federal Building in line for green upgrades". Concentratemedia.com. http://www.concentratemedia.com/devnews/annarborfederalbuilding0051.aspx. Retrieved 2012-04-21. ^ "Locations, Driving Directions, Parking". United States District Court – Eastern District of Michigan. 2009. Archived from the original on 25 August 2009. http://www.mied.uscourts.gov/Visiting/Locations/. Retrieved 2009-08-23. ^ "Ann Arbor courthouse". Web.archive.org. 2012-02-22. https://web.archive.org/web/20120222105240/http://www.ca6.uscourts.gov/lib_hist/Courthouses/michigan/annarbor.html. Retrieved 2013-06-29. ^ (3 April 1974) "Ann Arbor Votes $5 Fine for the Use of Marijuana". The New York Times. ^ Marshall, Steve (14 February 1990). "City Hopes to Thwart Michigan on Abortion Law". USA Today: 3A. ^ Cohen-Vrignaud, Gerard (12 February 1999). "Gay and Proud". The Michigan Daily. Retrieved on 4 August 2008. ^ Walter, Benjamin (26 August 2001). "Instant Runoff Voting (IRV)—History of Use in Ann Arbor". Green Party of Michigan. Archived from the original on 17 September 2008. http://migreens.org/hvgreens/aa-irv01.htm. Retrieved 4 August 2008. ^ "Government – City Council". Ann Arbor City Government. 2009. http://www.a2gov.org/government/citycouncil/Pages/Home.aspx. Retrieved 24 August 2009. ^ "The People's Republic of Ann Arbor". ArborWiki. 2010. Archived from the original on 5 May 2010. http://arborwiki.org/city/The_People%27s_Republic_of_Ann_Arbor. Retrieved 13 May 2010. ^ Cochran, Jason (October 2002). "Ann Arbor, Michigan". Budget Travel Online. Retrieved on 2013-03-05. ^ Brannock, Jennifer (2007-02-25). "Florida vs. Michigan: Ave Maria law school not a game to them". Naples Daily News. Retrieved on 2008-08-04. ^ Paula Gardner. "Cooley Law move into Ave Maria space good news for office real estate market | MLive.com". Blog.mlive.com. http://blog.mlive.com/paulagardner/2009/06/cooley_law_move_into_ave_maria.html. Retrieved 2012-04-21. ^ "Thomas Cooley opens new branch in old Ave Maria building". the National Jurist. http://www.nationaljurist.com/content/thomas-cooley-opens-new-branch-old-ave-maria-building. Retrieved 2012-04-21. ^ "Law school's lease of former Ave Maria site keeps area vibrant". Annarbor.com. 2009-11-07. http://www.annarbor.com/business-review/law-schools-lease-of-former-ave-maria-site-keeps-area-vibrant. Retrieved 2012-04-21. ^ "About AAPS: Demographics Data—Headcount by Grade and School". Ann Arbor Public Schools. 2008. http://www.aaps.k12.mi.us/aaps.about/aaps.data/headcount_by_grade_and_school. Retrieved 5 December 2009. ^ "Ann Arbor Open School". Ann Arbor Public Schools. 2007. http://aaopen.a2schools.org/. Retrieved 4 August 2008. ^ "About Our Programs". Ann Arbor Preschool & Family Center. 2009. http://preschool.a2schools.org/preschool.home/about_our_program. Retrieved 4 December 2009. ^ "City Guide—Private Schools". Arborweb.com. 2009. http://arborweb.com/cg/t0054.html. Retrieved 1 November 2009. ^ "Our Story: Program description". Washtenaw Technical Middle College. 2010. http://www.themiddlecollege.org/node/14. Retrieved 19 October 2010. ^ "VA Ann Arbor Healthcase System—About this Facility". United States Department of Veterans Affairs. 2007-07-10. Archived from the original on 5 September 2008. http://www.annarbor.va.gov/about/index.asp. Retrieved 2008-08-23. ^ "Water Treatment". City of Ann Arbor. 2005. Archived from the original on 2006-01-27. https://web.archive.org/web/20060127005708/http://www.ci.ann-arbor.mi.us/PublicServices/Water/WTP/int-treat.html. Retrieved 2008-08-23. ^ "About Us". Recycle Ann Arbor. 2007. Archived from the original on 2008-03-27. https://web.archive.org/web/20080327210526/http://www.recycleannarbor.org/aboutus/aboutus.htm. Retrieved 2008-08-04. ^ "Highways 10 through 19". Michigan HIghways. http://www.michiganhighways.org/listings/MichHwys10-19.html. Retrieved 2012-08-04. ^ "Highways 140 through 159". Michigan HIghways. http://www.michiganhighways.org/listings/MichHwys140-159.html. Retrieved 2012-08-04. ^ Michigan Department of Transportation (2007). Official 2007 Department of Transportation Map (Map). 1 in:15 mi/1 cm:9 km. Section C1–C11. http://www.michigan.gov/mdot/0,1607,7-151-9622_11033_11151---,00.html. Retrieved 2008-08-04. ^ "City of Ann Arbor Bikeway System" (PDF). City of Ann Arbor and Washtenaw County. 2007. Archived from the original on 2007-06-05. https://web.archive.org/web/20070605152004/http://www.a2gov.org/CommunityServices/Parks/images/bike.pdf. Retrieved 2008-08-23. ^ "Bus Routes and Schedules". University of Michigan Parking and Transportation Services. http://pts.umich.edu/taking_the_bus/routes/. Retrieved 2011-12-20. ^ "New AirRide bus travels between Ann Arbor and Detroit Metro". Michigan Radio. http://www.michiganradio.org/post/new-airride-bus-travels-between-ann-arbor-and-detroit-metro. Retrieved 2013-03-30. ^ Brandt, Karen L. (Fall 2005/Winter 2006). "Ann Arbor Bus Depot". The Modern 18 (2). Retrieved on 4 August 2008. ^ "Michigan Flyer—Home". Michigan Flyer. 2009. http://www.michiganflyer.com/. Retrieved 23 August 2009. ^ ": MSA airBus :: Welcome! :". Msa.umich.edu. https://www.msa.umich.edu/airbus/. Retrieved 2012-04-21. ^ "A Brief History". Central Michigan University—Clarke Historical Library. 5 February 2010. http://clarke.cmich.edu/resource_tab/information_and_exhibits/michigan's_ann_arbor_railroads/a_brief_history.html. Retrieved 19 October 2010. ^ "Pictorial History of Ann Arbor 1824–1974 (1880–1899) – Public Transportation and Changes in City Government". Ann Arbor District Library. 24 December 2006. http://moaa.aadl.org/moaa/pictorial_history/1880-1899pg4. Retrieved 23 August 2009. ^ Drukas, Alexander J. (27 March 2008). "Ann Arbor's classic brunch still delights". MLive.com. http://blog.mlive.com/ann_arbor_business_review/2008/03/ann_arbors_classic_brunch_stil.html. Retrieved 4 August 2012. ^ "About our services". University of Michigan International Center. Archived from the original on 20 June 2008. http://www.internationalcenter.umich.edu/about/services.html. Retrieved 2008-07-31. "Our International Visitor Leadership Program coordinator also serves as the University of Michigan's official representative to the City of Ann Arbor's Sister City Program, which manages relationships with six sister cities: Tubingen, Germany; Hikone, Japan; Dakar, Senegal; Juigalpa, Nicaragua; Peterborough, Canada; and Belize City, Belize." Fisher, Dale (1996). Ann Arbor: Visions of the Eagle. Grass Lake, MI: Eyry of the Eagle Publishing. ISBN 0-9615623-4-X. This page uses content from the English language Wikipedia. The original content was at Ann Arbor, Michigan. The list of authors can be seen in the page history. As with this Familypedia wiki, the content of Wikipedia is available under the Creative Commons License.